For years, Raphael84, a member of the Hair Transplant Network, worked his way through denial, anger, shame, and depression because of his receding hairline. He always felt inferior in social situations, afraid of bright lighting and weather conditions. Finally, he reached a decision – no longer would he hide behind concealers and hats – it was time to share his story with other hair loss sufferers. The hair loss forum gave Raphael84 a feeling of belonging and understanding. 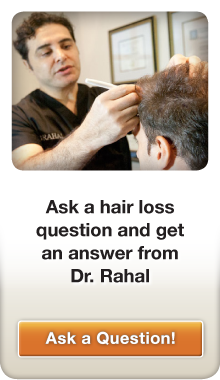 Members offered him a solution to combat baldness, and suggested Dr. Rahal. Just one year after his FUT hair transplant with Dr. Rahal, Raphael84 can’t believe the difference. He’s confidently embracing outdoor sports with a passion, and living each day to its fullest. Raphael84 posted his one year update to showcase his incredible and life-changing results. Raphael84 battled with denial, anger, shame, and depression because of a receding hairline. 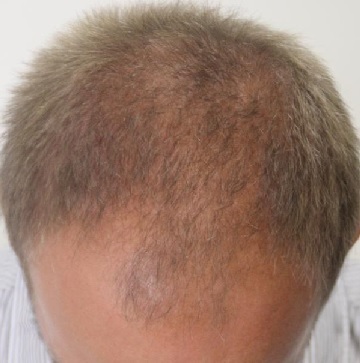 He joined the hair loss forum over a year ago to gain support and bust out of his bald rut. 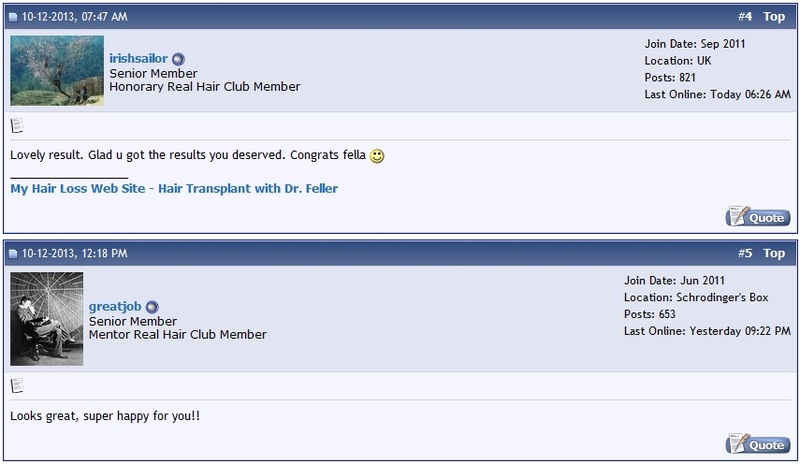 Members on the hair loss forum recommended Dr. Rahal for a hair transplant. Raphael84 took their advice. He is pictured here before, and one year after his successful FUT procedure with Dr. Rahal. He had 3968 follicular units to recreate the frontal hairline, frontal density and coverage. Raphael84 shared a wide range of before and after photos on the forum, to showcase his incredible results and experience with Dr. Rahal. The problems Raphael84 faced because of a receding hairline – withdrawing from outdoor sports and feeling inferior at social events –are clearly not his problems any more. 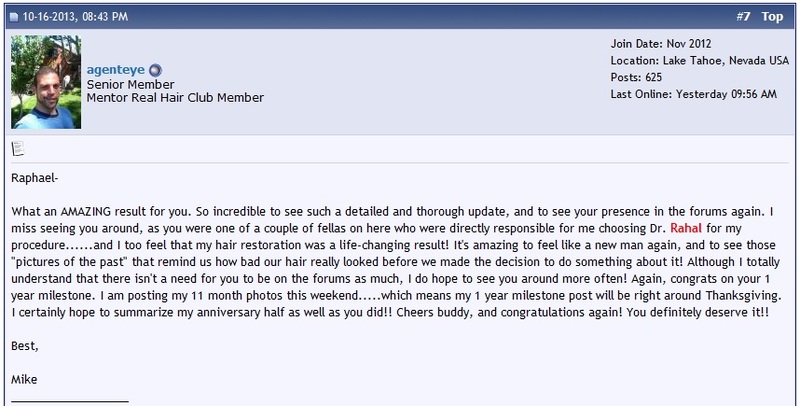 Members on the hair loss forum gave a lot of positive feedback on Raphael84’s life changing results. Senior Member, ‘agenteye’ praised Raphael84 for his inspiring review. Thanks to posts like this, he too decided to have a hair transplant with Dr. Rahal. 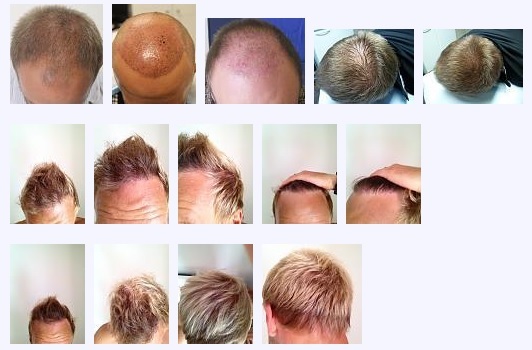 Forum member, ‘mrpredictable’ who also recently had a hair transplant with Dr. Rahal, was so amazed by the before and after photos, he too hopes his results will turn out just as great. Raphael84 can’t say enough about how happy he is to have his hair back, thanks to members of the forums for their support and for recommending Dr. Rahal. A lot of patients are rightly concerned about how they will look immediately after requesting Follicular Unit Transplantation. 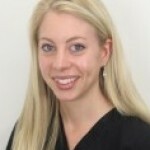 This post gives valuable insight into the procedure and more. 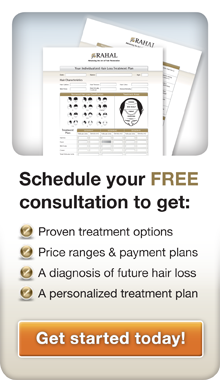 The post highlights how Dr. Rahal can help you make one of the most empowering and invaluable decisions of your life.